What Should We Build on Augur for 2020? The 2020 election cycle could be for Augur what the World’s Fair of 1893 was for electricity: the first major demo of the new technology’s potential and a peek into the future. I think that political prediction will be Augur’s first billion dollar use case. While it may not be until 2024 when Augur really shines on this front, 2020 can serve as an experimental sandbox to build and test new things atop the young protocol. Today, I’ll share some ideas for tools, apps, and types of markets to build on Augur for the 2020 election. These range on the scale of ambition and viability. Some are things that could be built independently while others could be developed on existing Augur marketplaces like Veil and Guesser. The possibilities are endless here, and my hope is to fire up the imaginations of builders and aspiring builders in the Augur ecosystem. 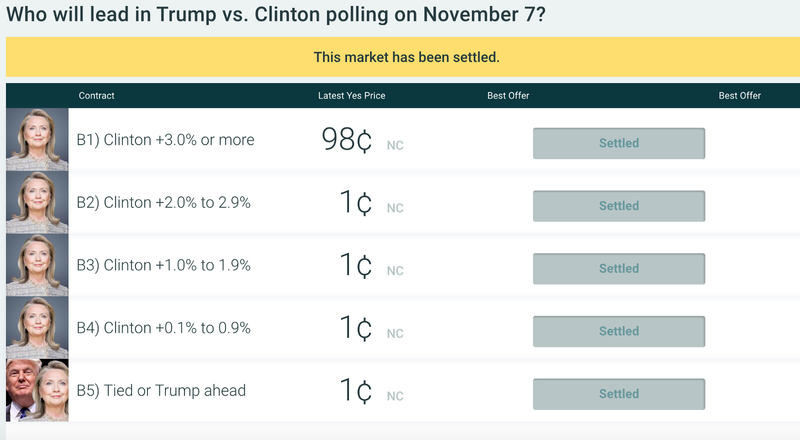 PredictWise aggregates and compares predictions from different forecasting sites like PredictIt and Betfair. For example, you can see each site’s forecasted odds that Kamala Harris will be the next president and her average across all the platforms. Unfortunately, PredictWise does not include decentralized prediction markets. We could use a new and improved alternative (or a browser extension you could use on PredictWise) that would include Augur predictions. Where possible, it would also compare trading volume and liquidity. As event outcomes came to light, it could potentially track the historical accuracy of each platform and use this data to model better predictions. It could also provide a realtime panel that tracked the most liquid markets on primary and general election days. This format limits precision and liquidity since traders can only bet on a bracket, not an exact percentage. And if you miss the right bracket by .1% your shares are worth nothing. Ouch. Representing such outcomes as scalar markets could be way more effective, and I don’t think this has been done before. While no caps, lower fees and censorship resistance may be Augur’s biggest differentiators when it comes to political betting, greater precision is another edge on the competition. Politics is intrinsically social. People want to share and argue their opinions. On PredictIt, there are already over 75,000 comments in the market predicting the 2020 Democratic nominee, and some of the site’s previous markets have topped a million comments. Currently, there’s no direct way to comment on Augur markets and interact with other traders. If an Augur marketplace like Veil or Guesser wants to increase user engagement, adding commenting could be a good move. Giving users the *option* to display their Ethereum address on their comments could increase accountability and let readers filter for comments from folks who have put their money where their mouth is. Price gaps between prediction markets present arbitrage opportunities. An arbitrage tracker would track price discrepancies on equivalent outcomes across different prediction platforms and optionally send notifications to users when price gaps hit a specified threshold. One challenge for anyone following politics is to filter through all the noise, sensationalist headlines and fake news, and identify what stories really matter. FOX or CNN may broadcast a seemingly scandalous revelation on Candidate X, but if the markets on her election prospects don’t move, it’s probably overblown. Markets never lie. It would help to have an alert system that tracked Augur and notified users anytime a major election outcome moved by more than say, 5%, in a 24 hour period. This would signal that something significant has happened. Using such an alert system could serve as a filter for what news to follow when. It would let us 80–20 the news, so to speak, spending 80% of our attention on the 20% of stories that really matter while saving slow news days for more important things. You could also give an impact score to different news stories after the fact based on how markets responded and let users sort stories in the last week or month by how much they moved the markets. Of course, a mature market is pricing in countless events and knowledge sources so this would be a rough estimate. What if you could get exposure to a basket of political outcomes via a thematic portfolio? This could be a useful way to express a broad conviction on political trends while minimizing exposure to eccentric risk e.g., a scandal surfacing on a particular candidate. For example, if you think a progressive will win the Democratic nomination, you could buy a “basket” of leftist candidates including Bernie Sanders and Elizabeth Warren. Or if you think a young person will win, you could buy a basket of youngish candidates like Cory Booker, Kamala Harris, and Beto O’Rourke. Monitoring the movement of these indexes would also be a good way to track meta trends. To take this a step further, a platform building this sort of tool could partner with political Twitter power users to make bespoke portfolios of their predicted candidates or political outcomes and make it easy for them to tweet out these portfolios and give their thousands of followers easy ways to buy in. I actually don’t think this idea is far-fetched, since, as I’ve written before, there’s a growing population with a unique convergence of traits that this sort of product could appeal to. The main traits are an interest in crypto, contrarian political views, a “skin in the game” ethos and an interest in predicting things. 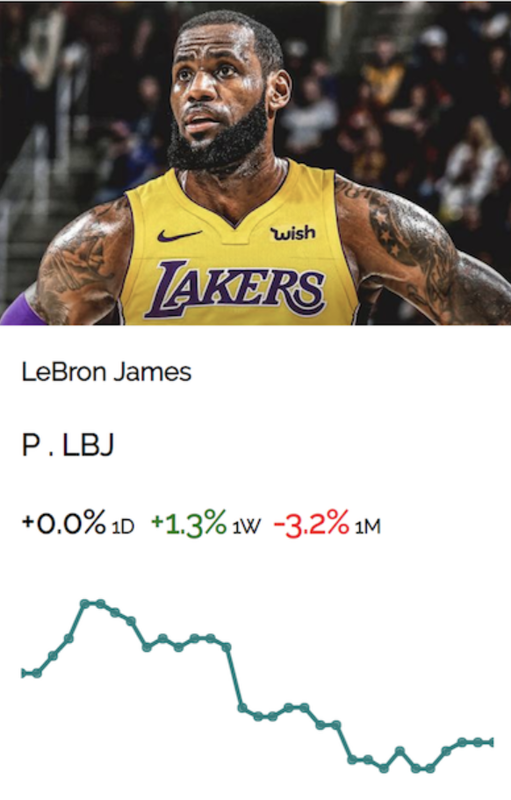 If you’re interested in making something like this, take a look at Pdot Index (portfolios of Augur markets tracking public figures) and Primotif (baskets of Augur shares and dy/dx short tokens) for inspiration. 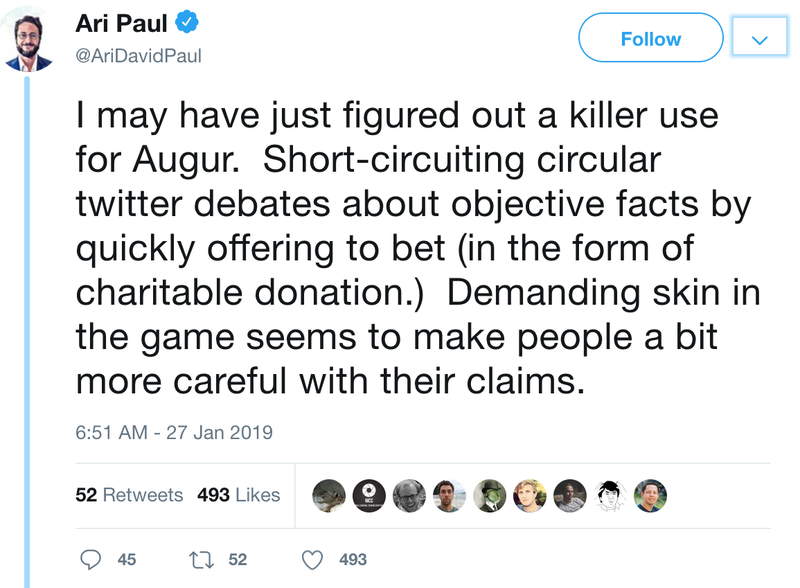 Imagine if that when someone made a prediction on say, Twitter, they actually backed it up with a stake on Augur. This would let us hold pundits accountable, filter out voices unwilling to put their money where their mouth is, and track the predictive powers of different pundits over time. I recently wrote about this and how Augur can help us make public predictions that are more accountable, useful, and honest. Nowhere would this be more useful than politics, where folks like to spew out opinions without backing them up. Currently, however, there is no easy way to provide a verifiable link to an Augur prediction. For example, when I did a primitive demo of a “staked prediction,” I used MyEtherWallet to sign a tx using the Ethereum address I had made the Augur prediction with and then used Etherscan to verify the signature. I also had to set up a new wallet, as I didn’t want to expose prior transactions. There should be a much easier way to do this, either built by an independent developer or by an existing Augur marketplace. If this is too great of a leap at this point, an Augur marketplace could start by simply providing the option to tweet a trade you’ve made with a link to the market in question. If you’re interested in working on any of the ideas I’ve mentioned or have other ideas you’d like to run by, feel free to get in touch.